These delicious treats are deceptively simple. Serve them as a light lunch or versatile side dish. Slice each tomato to obtain 1/2-inch thick slices from the widest portion of the tomato, making sure to avoid the core. 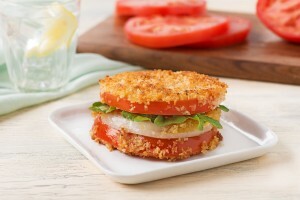 Spread 1 heaping tablespoon of mayonnaise on one half of the tomato slices. Top each with an onion slice, arugula leaf and a second slice of tomato. Dip each sandwich into the beaten egg mixture and then the bread crumbs. Gently shake off any excess bread crumbs. Set sandwiches aside. In a large heavy sauté pan, warm the butter and olive oil over medium heat. Slip each sandwich into the pan and fry until golden brown, about 3 minutes on each side. Remove and serve immediately.